In honor of Earth Day I'm reposting this piece from 2015 about Naomi Klein's book, This Changes Everything. If you haven't read it, consider this my second urgent request that you do so. ”May you live in interesting times," states the mythical Chinese curse, and without doubt we do. Until the last decade I thought living in interesting times would be fun and exciting. Now I'm not so sure. The world is changing so quickly that even the calmest among us feels agitated and anxious. Before we can catch up with the events of last week, they have spun into newer more complex versions of themselves. We are lost in a sea of uncertainty while the worries of tomorrow lay in wait. This interesting world is one we created and must now take responsibility for. We must conquer frustration and impatience and our own ignorance and solve our problems, including the most pressing, climate change—before which all other problems fade to oblivion. What good are your devices if no network exists, if there is no food or fresh water, if your home is under water, if the Gulf Stream has quit streaming? Naomi Klein is a Canadian writer who gave six years and a great deal of thought to the problem of global climate change, and I recommend her book, This Changes Everything. It's not an easy book, but you will be glad you read it. There is also a documentary film by the same name. Klein's book reminds us in heart-wrenching ways that this interesting world, this beautiful, endlessly fascinating globe spinning through space, is our only home, and we must protect it with the same strength and energy we protect our children or ourselves. There are ways to do this if we act quickly and with collective strength, and her well-documented book is an excellent resource, a good place to start. But what we also need to do, I think, in addition to marching and writing letters and donating money, and paddling kayaks in opposition to Shell, is to remind ourselves of our selves—or our souls if you prefer. Our disconnect from Earth has grown slowly over time. Conveniences like electric light and steam generation; and coal, oil and gas, and now the digital revolution, enticed us away from Earth's natural pace and rhythm. But ever so gently, so that we hardly noticed how alienated—and destructive—we have become. I am lucky to have easy access to the natural world and I have learned that if I pay attention it will speak to me. The caw of a raven, the sound of wind through the firs, the sudden bolt of a young deer, all work to bring me back to the present. Suddenly I am out of my head and back on the path, aware of the now. Nature is willing to help us if we only pay attention. And while a charming landscape is helpful, it's not required. We can attend while sitting in front of our always captivating screens by simply remembering that we are alive; that we are in the world Now. We may not like where we are but what matters is that we acknowledge the moment, that fleeting moment that is gone before you can name it. Life and Earth are gifts, and acknowledging that, however briefly, serves us all. Cousin Kay hugs an olive. I just returned from five days in northern California, visiting relatives with my daughter and granddaughter. We enjoyed ourselves despite the rain, and the darkness emanating from Washington. I had been dreading the release of Muller's report so it wasn't terribly surprising when Barr issued his "no obstruction" letter and Trump began crowing. I was lucky, however, to be surrounded by people who love me, so the punch in the gut was a little less painful. The trip itself was typical of our family gatherings; lots of laugher, lots of stories, good food of course, and never enough time. 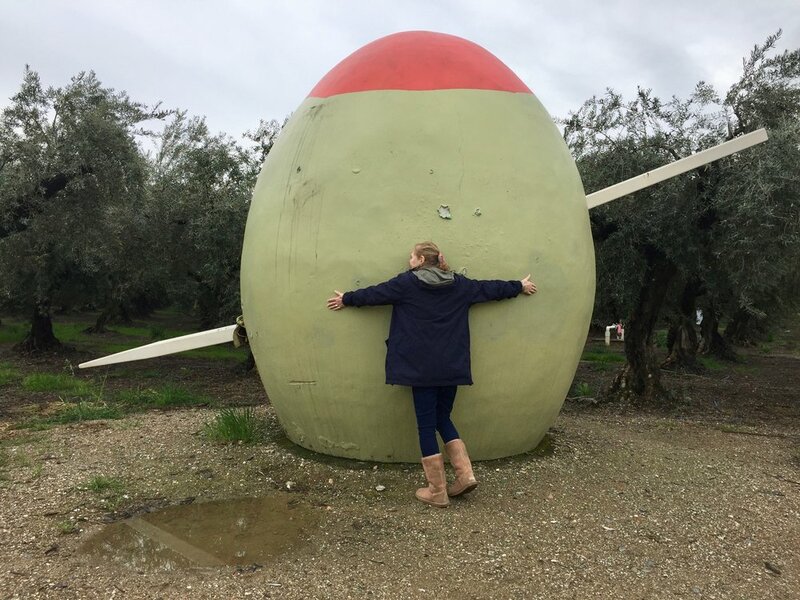 My daughter Jennifer has a habit of searching out roadside attractions, so one day we visited the Penny Candy store in Live Oak, and on another the giant martini olive outside Corning, "the olive capitol of the world." This was after we went wine tasting at the New Clairvaux winery and before we saw Captain Marvel. I can recommend all but the candy store, which Jennifer and I found grim, with too many rules, but Melina found amazing. It all depends on your point of view. The trip home was quick and easy and so was Lyft after I remembered to log into wifi and turn off airplane mode (Why isn't this damn phone working?) Eventually I made it home, to a hungry cat and a condo that could use some cleaning. Trips like this are always welcome interruptions, and it was good to touch again the landscape that formed me. Curiously, I never miss it until I'm there. Back in Oregon I wonder if I could live there again, and decide the answer is no. Oregon is home. It's also about as far as one can get from DC. And that's a very good thing. It was snowing this morning when I looked out and saw a gray hummingbird perched atop a piece of garden art on the covered porch. I sat and watched it from the couch. It was perched, but constantly moving, its head bobbing up and down, back and forth. It stretched tall and shrank back. I wanted to get closer, to know what, exactly, it was doing, but I didn't want to disturb it. After about five minutes I went into the back room and dug out the binoculars. From there I had a good view so I leaned against the bookcase and stood staring for several more minutes. It must have had mites, or fleas, because it kept scratching, stretching its neck and twisting around to poke with its long beak at feathers on its stretched-out wings and tail. It would lift its tiny feet to scratch on one side, then the other; and like a yoga practitioner, come back to center for a moment of rest before repeating it all again. I watched for a few minutes before returning to the couch. The bird was still there, doing the same things. Then I looked away for a moment and it was gone, flown into the snow that kept falling and falling but never sticking. I briefly wondered if the bird was as sick of this weather and I am. No, the bird is content to simply sit and groom itself while watching the snow. Like most nonhumans it lives only in the now, the very immediate now. Itch, scratch, rest, itch, scratch rest. No cursing the mites, no planning for the future or regretting the past. It is simply being a hummingbird right now. Just being. And just as nature has done so many times for me, it took me into the same now as the bird; she scratching, me watching. Not thinking, not planning, not worrying about the snowy road I may have to drive this afternoon. Just watching. It's so easy to get caught up in the drama of the day. But it's just as easy to glance out the window and enter the now. It only takes a minute. The Comcast repairman was here again today. It was the third visit in as many months and though they all go away thinking it is fixed, I alone know the truth. It's not. In the two years I have had a TV I have gone through three cable boxes and at least four visits, plus online troubleshooting. It's good that I only use cable to watch the news, and better that news is also available on my iPad. Still, it's paid for in my condo fees and it should work. But I digress. While Comcast was working away in the backroom I looked for something to do between conversations and fell back on Twitter—it's easily interruptible. The first tweet I saw took me to a short movie called The Overview Effect, astronauts talking about how their views of Earth and life changed after seeing our planet from space. I concluded that all humanity should do this. That was immediately followed by The Atlantic magazine offering an article awkwardly titled Scientists are Totally Rethinking Animal Cognition. It's also referenced as "What the Crow Knows" and begins with a discussion of the Jainism belief that animals as well as humans should be protected from injury and violence. Of course I like that idea and I thought briefly about becoming a Jainist but then I read that, among other things, they avoid cars because of possible damage to life and they avoid puddles because walking through one may hurt the microbes living there. While I heartedly subscribe to protecting all nature's creatures, becoming a Jainist doesn't feel practical—at least not in this life. Finding these two pieces reminded me again how much I love and enjoy the natural world, and that we are perilously close to losing it. And the fact that my cable TV isn't working is pretty small potatoes. It has been a year since Ray died (February 2) and I still miss him terribly. If he were alive today he would be on the condo board working to reduce the too bright outdoor lighting. I'm sure he'd also have opinions about Jainism, smart crows, and Comcast, but since he's unavailable I can't report them. But I am sure of one thing: he would say I watch too much news. Is there a woman who doesn't love a bowl? If there is I haven't met her. A few days ago in the Mexican town of Sayulita my daughter and I found our way into a shop filled with beautiful pottery of all kinds. But it was the bowls that captured us. Unique designs, colorful and subtle, and it wasn't long before we were picking them up and admiring. "Mom, look at this one." "Oh, my gosh. And look at this." We finally had to tear ourselves away; our companions were getting restless. Take any group of women shopping in a store that sells china or pottery and almost always they will end up caressing various bowls. Inevitably, one will say "I love bowls." "Me too," says another. "I have so many bowls I have no room for more." To state the obvious, bowls hold things; they are practical. Little bowls hold little things: olives or nuts; paperclips or bobbie pins. Large bowls hold larger things, a casserole for your family, or a salad for a pot luck dinner. Bowls, which are among the first items our ancestors created, are loved and appreciated in a way other utensils aren't. And I think women appreciate them, not only because they are useful and beautiful but because on a more subtle level they represent ourselves. For what is a uterus if not a life-containing bowl? Proper bowls are circular, which is a comforting shape. Not for me that mean looking triangle—such sharp points—or boring rectangle, or worse, a parallelogram. No, I'll take round every time. Round like the belly of a pregnant woman. Round like the earth that sustains us and like the sun that warms us. Round like a bowl. I write this on the first day of a new year, as we begin another circle around our sun, a year that's bound to be confusing at times. But I have high hopes for 2019, if we can summon our better angels and remember our history; remember that together we succeed. As a small child I was taught this verse by Edwin Markham, and thinking about the year ahead it came to mind. In the year 987 Grand Duke Vladimir of Kiev, seeking a religion that could unite his people, sent envoys to study the beliefs of his neighbors. They reported back that "there is no gladness" among the Moslem Bulgarians; "no beauty" in the temples of the Germans. But they found such beauty and awesomeness in the Orthodox Church of Byzantium that "we know not how to tell it." Which is how the Russians became Orthodox. I first heard this story many years ago and have always thought it an intriguing way to choose a religion—though the need to choose still escapes me. Still, using beauty and gladness as decision points says a good deal about the power of those qualities. The envoys had attended services in Constantinople's Hagia Sofia, a structure designed to impress when consecrated in 537, and still does. I can easily imagine them awestruck as they stood looking up and up into the vast dome. The most beautiful thing I ever saw—and I am lucky to have seen much—is Michelangelo's Pietà, in St. Peter's Basilica in Rome. It wasn't the religious symbology that captivated me. It was the soul of the artist exposed in marble. And while the image of Mary holding Christ's crucified body is one of sorrow, what I felt when I stood in front of it was tremendous awe and joy; a kind of affirmation. If a flawed human could create this otherworldly masterpiece, I thought, there is goodness in us all. It strikes me as wise of Vladimir's envoys to suggest beauty and gladness as vital aspects of religion, and I find it sad that so often today religion buries joy in strident ritual. But we can’t give up on gladness. During this season of celebration and light and busyness it's even more important to know—despite the evening news and a sinking stock market—that we create our own joy. It's inside us always, waiting to be called on. We just have to pause, and remember. Wishing You All the Gladness and Beauty of the Season.